TD03 Ford Transit 2.2 Duratorq 85 / 100 л.с. 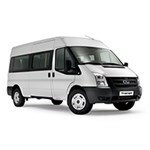 TD03 Ford Transit 2.4 TDCi 115 л.с. TD04 Ford Transit 2.40 H9FA 137 л.с.